Producers Norman Whitfield and Barrett Strong went into full-blown psychedelic soul for this album, having dabbled in it considerably on the previous two albums, 1969's "Cloud Nine" and "Puzzle People". The traditional "Motown Sound" was abandoned and we had rock guitars, electronic keyboards, sound effects, multi-tracked vocals and a huge thumping, funky drum sound. the producers and The Temptations virtually invented "psychedelic soul" as they merged funky rhythms, soulful vocals, rock psychedelia with vast-emerging black consciousness and environmental issues. This was really something quite ground-breaking. 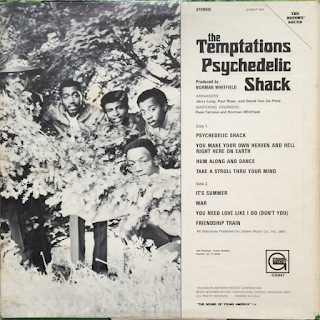 The front cover sees the band members pictured in the windows of a gaudy hippy "shack" with a peace sign and "flower power" graffiti on it, along with myriad rainbow colours. They look a bit bemused by it, to be honest. Whitfield was far more "on message" than the individual group members were. Paul Williams was ill, and Eddie Kendrick was falling out with Otis Williams and Melvin Franklin. Listening to the album, though, you would never know it. They simply obeyed Whitfield's commands and laid it down. The title track was a superb, energised and catchy opener, while "You Make Your Own Heaven And Hell Right Here On Earth" (covered also by Whitfield's The Undisputed Truth) introduced us to that intoxicating funky beat and cynical, portentous lyrics. "Hum Along and Dance" (later covered by Rare Earth and The Jackson 5) had a rich, deep throbbing bass line matched by the vocals in places and a huge pounding rhythm. This was soul the like of which had not been known before, with the possible exception of Sly & The Family Stone. The vocals are only occasional, it is basically an instrumental groove that segues into the bass line of the trippy "Take A Stroll Through Your Mind". It vocally delves into their earlier hit "My Girl" for a line or two before heading into eight minutes of typical early seventies stream of consciousness stuff. This is as druggy as any Motown act ever got. The bass line is wonderful throughout the track and one hell of a buzzy guitar joins the fray half way through, along with some gorgeous, crystal clear cymbal work. Remember, this is a group previously known for three minute soul/love songs coming out with adventurous material like this. Good Lord above, the times were a-changing. 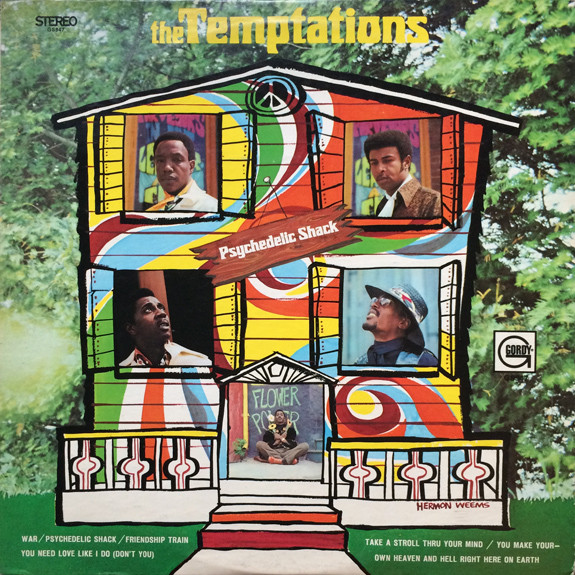 "It's Summer" was the only traditional, Motown-style love song with those typical Temptations harmonies to the fore. However lovely it is, however, it sits somewhat incongruously with the rest of the album's "conscious" offerings. Next up they cover Edwin Starr's iconic anti-war song, "War". Although Starr's version is the definitive one, this one cuts the mustard - "good God, y'all...". "You Need Love Like I Do (Don't You)" is a love song, but one hell of a funked-up one. It is full of buzzy guitars, thumping drums, great vocal harmonies and rumbling bass. Classic turn of the decade Temptations. "Friendship Train" is a captivating call and response musical call to arms to end the album. It was successfully covered by Gladys Knight & The Pips on their "Nitty Gritty" album but this is the "go to" version. Racism, political corruption, the Vietnam war - get on that friendship train and forget those things, man. "Shake a hand, make a friend...this train stands for justice, this train stands for freedom..". I couldn't have put it better myself, both in 1970 and right now. Say it loud, brother. This was a superb track, from a superb album. This album should be mentioned in the same breath as "What's Going On". It rarely does, but it should.